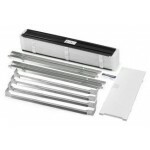 A filter is the most essential detail of every air purifier that exists today. Since such equipment performs all of the cleaning work, making the air in the room fresh and healthy, equipping the device with the right filter is crucially important. This guide will help you select a filter that will fit your air purifier. The most common type of a filtering technology that a majority of air cleaning devices use is HEPA. HEPA filters help dispose of biological pollutants and bacteria and make the air healthier. However, there are other filtering technologies that clean the air from other pollutants such as harmful gases, odors and micro particles. This means that you will have to specify the type of filter your air purifier uses before you start shopping. 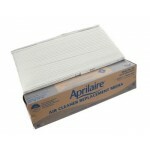 After the type of the air purifier filter is specified, you will have to calculate the filter’s capacity. This step will allow you to know how long a replacement filter will last and when would you need to change it again. This knowledge helps calculate the operation cost of the device and plan the budget accordingly. 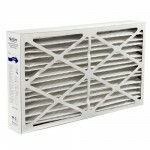 The next factor to consider when selecting an air purifier filter is the material it is made from. Since this is the part that performs all the cleaning, you need to ensure it is environmentally friendly and safe to use. Any filter’s material should not be toxic or allergenic; otherwise there’s no point of using it. Carefully read the filter’s description before you buy it and ensure that it complies with the industry’s safety and quality standards. Price is also a very important factor which you should start considering before you even buy an air purifier. 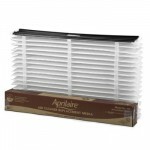 Oftentimes a device with significantly lower price than similar air purifiers uses very expensive filters. 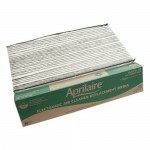 Since they should be changed at least twice a year, you will spend huge amount of money on such purifiers’ maintenance. Always calculate the operation cost of any device before you buy it. Is it safe to use an air purifier in a house? 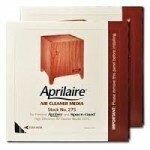 Modern air purifiers are designed and manufactured with safety in mind. However, some of the air-generating devices that are sold today have nothing to do with providing you with clean air. Ozone generators, for example, not only don’t make the air cleaner but also represent a serious danger to human health. As long as you don’t use an ozone generator as an air purifier, you and your loved ones are safe. 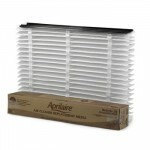 Aprilaire air purifier filters are necessary to maintain the effectiveness of your HVAC system. 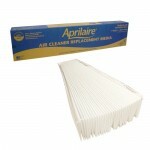 These replacement air purifier filters are well-regarded as being some of the easiest to install in the industry. This will get your Aprilaire device back up to peak efficiency, helping to eliminate airborne particles and pathogens from the air. Aprilaire is committed to creating an unparalleled level of indoor air quality, improving temperature, humidity, air purity and air freshness in the process. 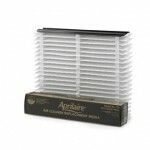 Westside Wholesale's selection of Aprilaire replacement air filters are factory originals, allowing for a perfect fit.